Fresh lamb cut rubbed with secret lamb mix, salt, and mint, sprinkled with lemon juicy for more strong taste. Everything was slow cooked for 2.5 hours on the fire in the forest near river! You may have to be patient, constantly rotating meat to roast it evenly is not a walk in the park but it worth every minute spent! Chop handful of fresh mint and mix it with 1-2 tbsp. 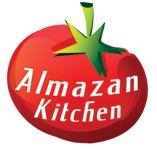 of Almazan lamb mix, 1tsp. of rock salt and lemon juicy. Rub lamb cut with spice mix we made in the step #2 well from each side.